There has been speculation in recent days that the Prime Minister will alter or drop legislative proposals that were expected to be included in the forthcoming Queen’s Speech to Parliament. This reflects growing disquiet among Conservative backbenchers many of whom feel that the Liberal Democrats are exercising excessive influence on coalition policy. The unease has stiffened following less-than successful local election results. It was rumoured that the Prime Minister was minded not to include a Bill on reform of the House of Lords in the Queen’s Speech. Yesterday the State opening of Parliament occurred and the Queen set-out the forthcoming legislative programme for Parliament, including a bill for an elected upper-chamber. The House of Lords Act passed in 1999 was the last occasion of so-called reform of the Upper House. The Government of Tony Blair then put through legislation for removal of most hereditary Peers, a residue remaining which it was thought would be replaced over time by appointed Life Peers. It was understood at the time that further reform would be forthcoming. The assumption was that in a modern society it was inappropriate for individuals with seats inherited from their forefathers to have legislative influence. The House of Lords as now constituted cannot be described as aristocratic since it is a Chamber effectively based upon political patronage. The term ‘aristocracy’ originally referred to a form of government wherein a small elite of the best qualified exercise power, without any necessary assumption that this should be by hereditary right. 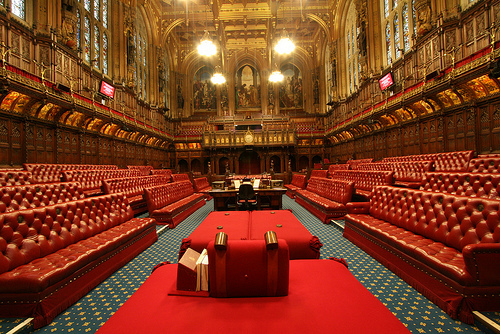 If House of Lords reform is really required, why not a properly aristocratic Upper Chamber? At present the crossbench grouping includes about 25% of those sitting in the House of Lords. The vast majority of these have been rewarded for service and dedication in some professional capacity. Baroness Greenfield is noted for her contributions to medical science. Lord Collins of Mapesbury had an illustrious legal career as a judge. Lord Broers was Vice-Chancellor of the University of Cambridge and President of the Royal Academy of Engineering prior to entering the House of Lords. There are, of course, individuals of similar note who take a particular party whip, but many of those within political groupings owe their positions solely to patronage. The House of Lords has an important constitutional role in scrutinising drat legislation normally initiated in the elected House of Commons, thereby acting as a check on potential excesses in popular politics. It is important that such a role be retained. The proposal to create an elected Upper Chamber would almost certainly produce a more party-political entity, one into which few otherwise noteworthy individuals, such as those mentioned above, would gain (or even desire) access. A properly and appropriately aristocratic House of Lords should have the experience and intelligence needed adequately to scrutinise draft legislation. The political parties should neither be able to recommend individuals nor have any say over the constitution of an appointing committee. Those who sit should be sought for professional expertise and personal integrity. Such a Chamber would offer the desired checks and balances while remaining immune to the dark arts of party whipping. It is often complained that British public life lacks individuals of outstanding integrity and that there are too many ‘career politicians’. Many, moreover, believe that party whips exercise disproportionate power. A House of Lords such as we have envisaged here would go a long way towards meeting such criticisms. If a meritocratic elitism is to be welcomed in our education system, why not also in the political system?